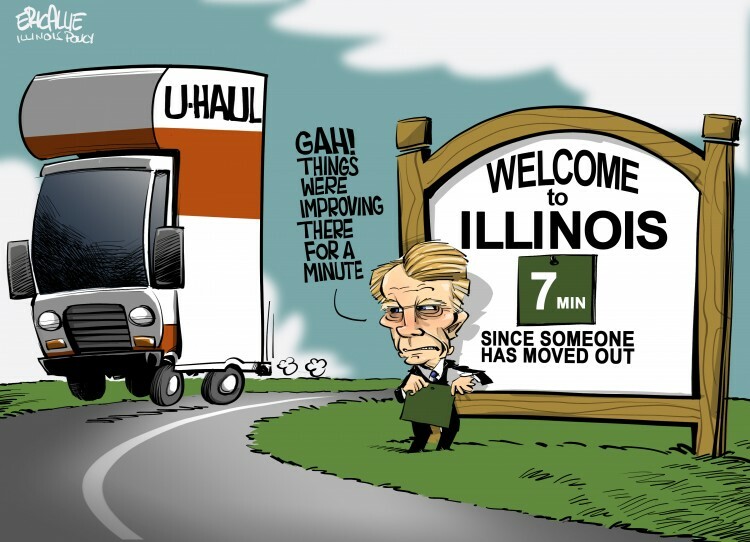 As Eric Allie’s cartoon depicts, while Illinois’ lawmakers fight over budgets, mandates, and tax increases, every 7 minutes the state loses residents and their income. 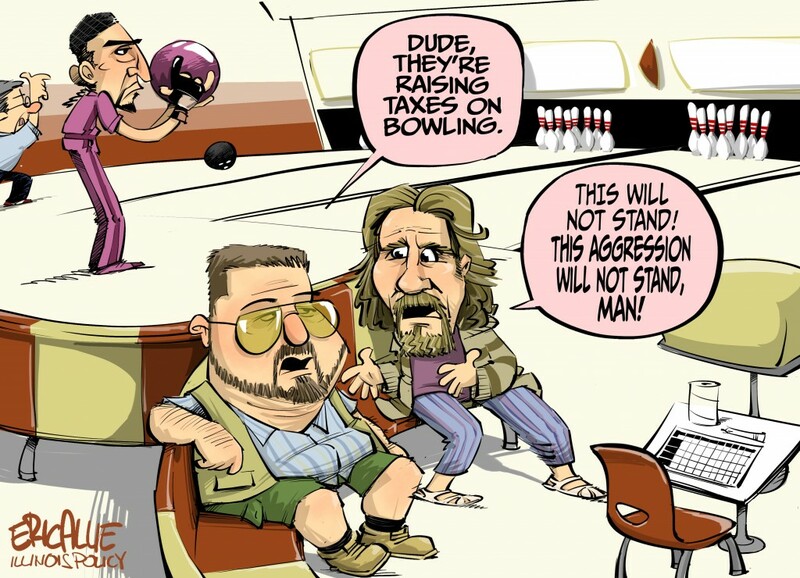 How Money Walks data shows that between 1992 and 2014 (the most recent year for which IRS taxpayer data is available), Illinois lost $41.86 billion net adjusted gross income – every minute, the state loses $4,422 – to states with a friendly tax climate like Florida, Texas, and Arizona. Travis H. Brown recently wrote in Forbes about how when it comes to solving Illinois’ economic woes, two of the state’s most powerful leaders are taking very different approaches. Republican Governor Bruce Rauner, who’s been a champion for real reform since the day he announced his candidacy, like with his plans to undo unfunded school mandates – the Springfield-manufactured directives that can cost districts a lot of money, and freeze property tax rates, has faced major opposition from Democratic Chicago Mayor Rahm Emanuel who recently called for property tax hikes totaling $588 million over the next four years, in order to fund police and fire pensions and to balance the budget. This is after Emanuel already made matters worse with the introduction of new tax rules that will notably increase the cost of using popular streaming services like Netflix, Hulu, and Spotify which would stifle business growth and deter relocation for existing businesses or start-ups to choose Illinois as headquarters. 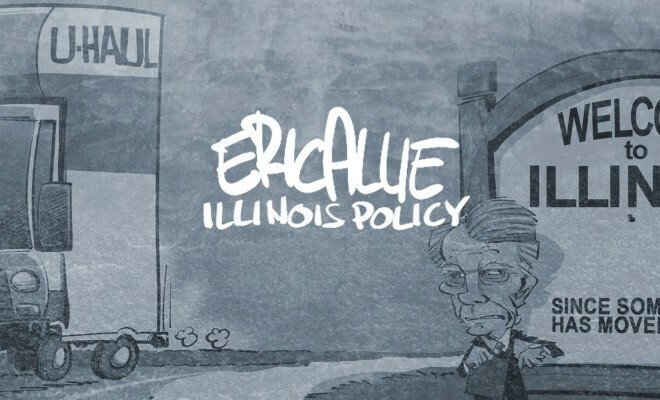 Both men have provided strong leadership in the past, but it appears that Rauner is taking a more proactive approach securing Illinois’ financial future. Citizens also need to look to the states’ burdensome tax policies and taking action by letting lawmakers know that reform needs to happen. Next Story → Is Economic Equality Better in States With Low Income Taxes?